Christmas is one of my most favourite holidays aside from the birthdays of my three beautiful daughters. I love the excitement and sparkle in their eye when they open the gifts “Santa” and mommy has placed under the tree. Having three daughters; Abby who is 12, Hailee 9 and our sweet little Bella who will be the BIG ONE on December 27th I have experienced over a decade of toys! I am pretty well versed when it comes to things my children will like as well as other children. The toys have changed over the years since my first daughter was a baby. With that said I will admit we still have some of the classics from Abby that her sister used as well did my nephew. They have made their way back to Bella and will continue to be passed through the family as long as they work which if they are still working after 12 years I think it is safe to say they are well built toys! Bella received two toys from the amazing folks at Bright Starts to review and I have to say I am loving how bright and colourful their toys are. It really helps stimulate little ones and keep their attention for longer than some other toys. The Hide & Spin Monkey by Bright Starts is uber cute! 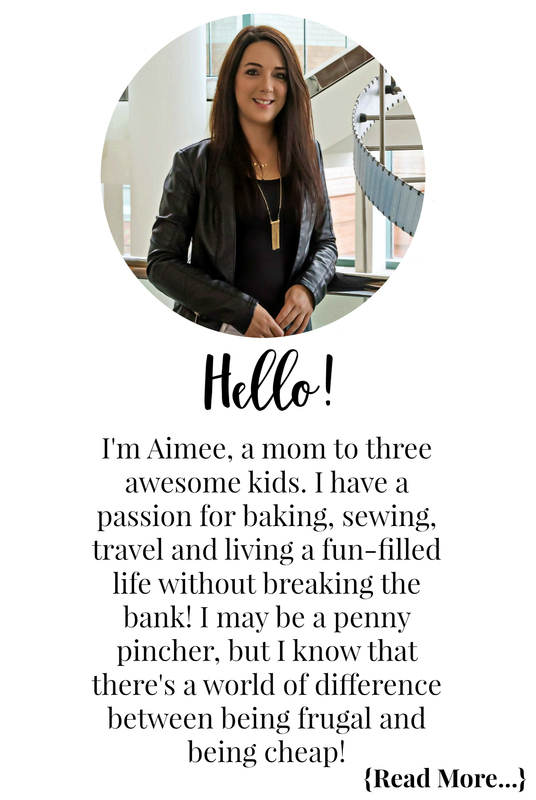 It takes AA batteries which I love as they are the most common in our home – no running out for C or D batteries! It comes with 5 colourful balls that can be placed in the monkey’s hat or inside the barrel. When Bella pushes his nose the monkey ducks down into his barrel and releases the balls down where they spin around. You can swing open the leaves to allow the balls to slide down onto the floor. Bella just loves when the balls come down and spin around. It has great sounds and lights and counts as you put the balls into the monkey’s hat to teach counting. There are three buttons on his hat that help teach shapes and colours. Bella is starting to stand up at everything and this is a perfect toy for her at this stage as she can sit and play or stand up, whatever her heart desires! 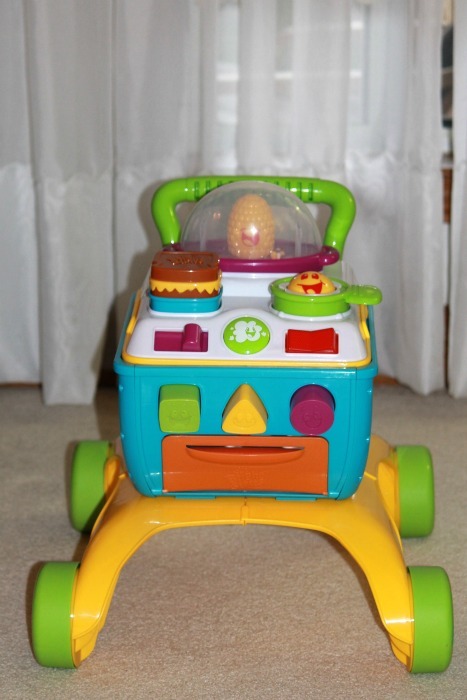 The second toy she reviewed was the Bright Starts Giggling Gourmet 4-in-1 Shop & Cook Walker. As you can see in the picture above this toy is very colourful and has lots of great activities to keep baby entertained for hours! With Bella getting close to being a big one year old she is forever standing up and walking around holding on to things like the couch and her playpen so this toy is perfect for her age. I love that it has locks on the back wheels of the cart to keep in in place so the cook top becomes a stationary activity table and when the lock is removed Bella can walk around assisted by mommy with her new toy! Bella finds it hilarious that the popcorn pops as she pushes the cart along. 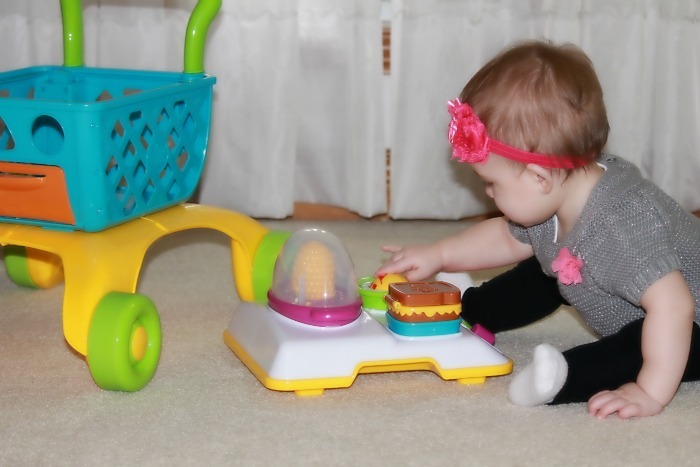 When she is a little older we can remove the cook top to reveal a shopping cart that she can load up – just like mommy at the grocery store – Extreme Couponer in training? The top part of the toy is removable from the cart to allow for play on the floor too. It offers lots of developmental activities including cooking sounds that sizzle and pop corn that pops, slide the lever and the silly sandwich pops up, push the light up button for sizzling sounds or spin the egg roller. Can’t forget that it also includes 3 shapes for shape sorting fun. 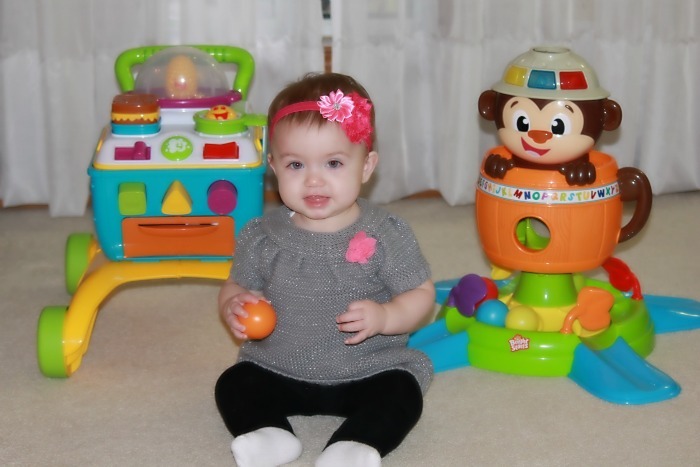 Bella and mommy have to agree and give these two amazing toys by Bright Starts our 4 thumbs up! Follow Bright Starts on Facebook, Twitter, Instagram, Pinterest, Youtube and check our their Website for more great gift ideas! Disclosure: Although this post has been sponsored by Brights Starts, the opinions and language are all my own, and in no way do they reflect Bright Starts. Any product claim, statistic, quote or other representation about a product or service should be verified with the manufacturer, company, provider or party in question. I love the Hide & Spin Monkey so much! Not only is it cute but it looks incredibly educational. I love how they learn through play at this age. I think these are so cute. It is my favourite age for kids, when they are toddlers. So cute. Those are great toys! My DD3 would love that shopping cart to this day! She loves playing with food! oh look at your little cutie having fun! I miss that stage! 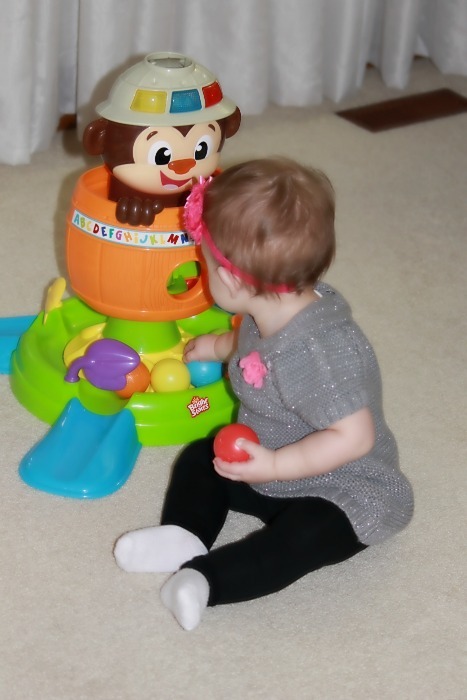 We have that monkey and my 20-month-old loves it!!! It’s also a huge hit with any of her little friends. Balls… it’s all about the balls! 🙂 Kids love balls at that age. And Bright Starts has so many great toys for them!!! 🙂 Thanks for sharing. These are great toys. I like the brand because it’s creative and durable also. Bright Starts toys makes some pretty impressive products! These toys are really great for kids. The way they come apart and turn into multiple toys is really great for different stages.